"The advertisements and marketing by EOS emphasizes that the product is 'organic' and 'gluten-free,' aligning the product with popular dietary trends, despite the fact that the lip balm has no consumable value," Cronin says. And despite claims that the balms are organic, they contain sodium hyaluronate, ascorbyl palmitate, tocopherols, and butyrospermum parkii, which the FDA considers a "major allergen," according to the complaint, Courthouse News Service reported. The company says the product is safe and the suit is "without merit." "Our products are safe to use, are made with the highest quality ingredients and they all meet or exceed all safety and quality standards set out by our industry. An independent laboratory puts each of our products through a battery of rigorous testing to ensure this is the case," EOS says in a posting on its Facebook page. But Cronin says that despite the claims of celebrity endorsers including Kim Kardashian, Britney Spears, and Miley Cyrus, thousands of consumers are experiencing "devastating adverse reactions to the product, consisting of mild to severe rashes, dryness, bleeding, blistering, cracking and loss of pigmentation, lasting from a few days, to a few months, and some consumers with long lasting and perhaps permanent symptoms." Cronin says she bought EOS Summer Fruit lip balm on Dec. 4, 2015, noting that its packaging claimed "EOS keeps your lips moist, soft and sensationally smooth" and had no warnings about side effects. But after using EOS, Cronin said her lips became dry and coarse. She used more EOS and developed blisters and rashes that required medical care, she said. Cronin posted about her experience on Facebook and said her post "set off a frenzy of responses" from other consumers who said they had similar experiences. Not all the Facebook posts were sympathetic though. "Lmfao, people are so stupid. 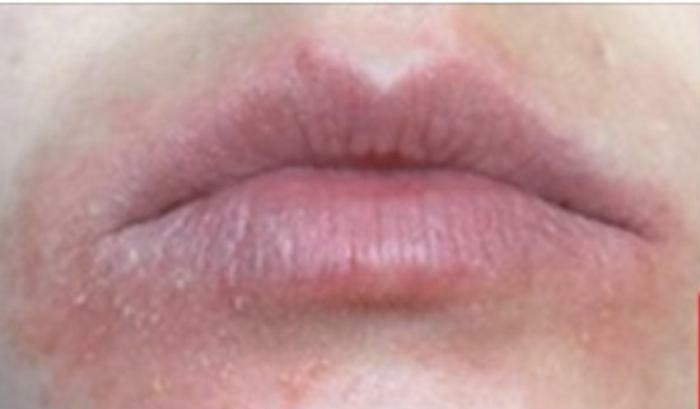 This happens when your lips are chapped and you over use ANY lipbalm [or] lick your lips too much," said Facebook user Chelsea Bateman. "This used to happen to me in middle school ALL the damn time because I was dumb and would lick my lips constantly when they were chapped.EOS wasn't even a thing then."